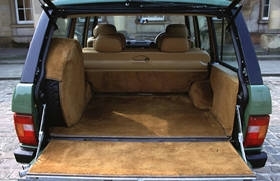 This Range Rover is one hundred per cent original - put simply, it is as close to a new 1984 Range Rover you can get without the aid of a time machine. It has had two owners from new, although both individuals were known to each other and the car has been garaged from new. Looking at the interior of the vehicle and you can see the beginnings of luxury creeping into the Range Rover concept, even though it remains somewhat sparse when compared to the top of the range 4.6 HSE of today. A208 KLL benefits from alloy wheels (optional in 1984), front and rear armrests, wood door cappings, loadspace carpets and rear seat belts. Notable from their absence however are electric windows, air conditioning and a sunroof. At least power steering was standard back then! Mark (The Owner) has priced the Range Rover at just under ten thousand pounds, some five thousand pounds less than it cost in 1984. The list price back then was 12,340, which once you'd added car tax (1,028.33) and VAT made a total of 15,373.58. Option pack 'C' increased the price by a further 367.53, as did alloy wheels (336.38) and inertia rear seat belts (66.03). Still good value by anyone's standards. A208 KLL was first registered on 26 June 1984 by Henleys Limited in Ewell, Surrey. Its first owner was a Mr Mcleave of Wimbledon (believed to be a solicitor), who bought it as a third car for weekend use. As such it only covered 7963 miles in his fifteen years of ownership - an incredible 530 miles a year! 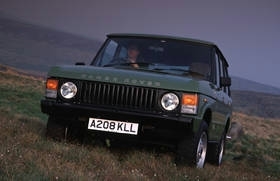 In January 1999, the Range Rover passed on to its second owner, a friend of Mr Mcleave, who had been asking him for first refusal should he ever consider selling the car. Appropriately, Mr Mcleave replaced the Range Rover with a new one and A208 KLL was relocated to the Clapham Common area of London. The new owners used the vehicle more frequently, adding another 5,000 miles within the next twelve months, bringing the total up to 13,000. Unfortunately for them, a change of regulations by the local council meant that they no longer had the use of their rented garage to keep the vehicle safe and secure, and they were forced to use on-street parking. The fear of damage, theft or vandalism meant that they had to replace the precious classic Range Rover with more mundane transport. It is at this point that Mark Griffiths and Huddersfield Land Rover Centre entered the story (cue fanfare of trumpets, smoke, etc). As soon as he heard the specification and history of the vehicle over the telephone, Mark knew that it was pretty special and headed down to London to look at the vehicle himself. At 8.30am he was on the doorstep checking the documents and taking the vehicle for the obligatory test drive. It didn't take much to convince him about the car, and an hour later, the deal was done and the Range Rover was being trailored back up North on the M1. When I got behind the wheel, it had had a full service, new MoT and a thorough going over - a process that had restored it back to the condition it left the showroom if you like. The barely run-in V8 engine was beautifully smooth, the gearbox precise, while the seats (especially the rear ones) look like they've never been sat in. 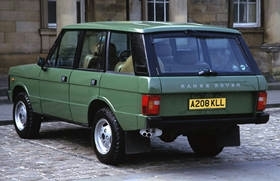 Once again, driving a Range Rover of this age and in this condition is something like going back in time. You can't even imagine a Range Rover without electric windows and power everything these days, but seventeen years ago this was creme de la creme of Solihull's production. Even so, the vehicle definitely feels 'right', and you start to realised quite why the Range Rover was a success from the moment it was launched. A fantastic example that deserves to be cherished by an enthusiast.